Many coastal plain wetlands receive nutrient pollution from agricultural fields and are particularly vulnerable to saltwater incursion. Although wetlands are a major source of the greenhouse gases methane (CH4) and nitrous oxide (N2O), the consequences of salinization for greenhouse gas emissions from wetlands with high agricultural pollution loads is rarely considered. Here, we asked how saltwater exposure alters greenhouse gas emissions from a restored freshwater wetland that receives nutrient loading from upstream farms. During March to November 2012, we measured greenhouse gases along a ~2 km inundated portion of the wetland. Sampling locations spanned a wide chemical gradient from sites receiving seasonal fertilizer nitrogen and sulfate (SO4 2−) loads to sites receiving seasonal increases in marine salts. Concentrations and fluxes of CH4 were low (<100 µg L−1 and <10 mg m−2 h−1) for all sites and sampling dates when SO4 2− was high (>10 mg L−1), regardless of whether the SO4 2− source was agriculture or saltwater. Elevated CH4 (as high as 1,500 µg L−1 and 45 mg m−2 h−1) was only observed on dates when air temperatures were >27 °C and SO4 2− was <10 mg L−1. 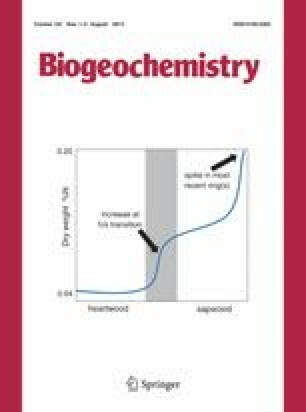 Despite elevated ammonium (NH4 +) for saltwater exposed sites, concentrations of N2O remained low (<5 µg L−1 and <10 µg m−2 h−1), except when fertilizer derived nitrate (NO3 −) concentrations were high and N2O increased as high as 156 µg L−1. Our results suggest that although both saltwater and agriculture derived SO4 2− may suppress CH4, increases in N2O associated with fertilizer derived NO3 − may offset that reduction in wetlands exposed to both agricultural runoff and saltwater incursion. The online version of this article (doi: 10.1007/s10533-014-9986-x) contains supplementary material, which is available to authorized users. We thank Steven Gougherty, Valerie Schoepfer, and Brooke Hassett for field and lab assistance, and Raven Bier for providing the first draft of Supplemental Fig. 1. Funding for this work was provided by NSF DEB 1216916.